Enjoy cute, funny birthday status for Whatsapp in Hindi, English. Get cool, best birthday status for Whatsapp, facebook, girl, boy, husband, and wife. 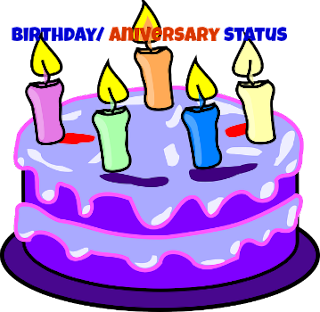 We have only new and latest birthday status quotes or messages for you. If you are looking to wish birthday to your near or dear one then enjoy our Hindi birthday status. These statuses will help you to share your birthday quotes via text or images in Hindi. Can Read: Best funny status for Whatsapp in Hindi and English. सोचता हूँ, जन्मदिन पर क्या तोहफा दूँ? आज गुलाब को ही गुलाब कैसे दूँ ? आज की पार्टी कुछ खास होनी चाहिए, जिसमे लडकियाँ बिंदास होनी चाहिए,पर मेरी वाली नहीं आनी चाहिए। Happy Birthday dear. आप तो बिना बात के ही मुस्कुराते हो,दिन-भर पकाते हो, कल जन्मदिन है आपका, इसी लिए भाव खाते हो। I Love You. मेरी जिंदगी को सँवारने वाली का आज जन्मदिन है,काश की मैं खुदा होता, अगर होता तो उसे अमर कर देता। Happy birthday angel. Can Read: Best friendship status for Whatsapp, Facebook. In case, you are looking for cute, funny, witty, and hilarious birthday status for Whatsapp, then we have the best birthday quotes in English for you guys. Enjoy and share it with friends as well. Can read: Best party status, quotes for Whatsapp, Facebook. I am happy that I got the best friend like you, Happy birthday dear. Counting birthdays are good for us, more we count more we will live. Happy birthday, friend. God gifted you this beautiful world to live, and friends to celebrate your birthday. Many many happy returns of the day. You must be the precious child of the god, see your Whatsapp got hanged with lots of birthday wishes. Accept my wishes as well. Be nice and cool while hosting your birthday, enjoy and let others enjoy your birthday. I enjoy cake and party and see I have 365 friends to enjoy whole year. people celebrate a birthday with sweet or chocolate cakes but I celebrate my birthday with my delicious love. Don’t count anything this day, get countless wishes, gifts, love and countless bill for your dad. Happy birthday, dear. People celebrate their birthday with friends, and family, let’s celebrate with someone who doesn’t have a family. You got two holidays, one is Sunday and other is a birthday. Manny many happy returns of the day. Forget every tension, and enjoy your birthday with full passion. Happy birthday, dear. Can Read: Cute girl Status for Whatsapp, Facebook in Hindi and English. We have just seen cool, cute and funny birthday status for Whatsapp in Hindi, English for a boyfriend, girlfriend, husband, wife, him and her. If you have any query or suggestions then do write to us. Can read: Best new year status, quotes for Whatsapp. If you liked our content on best birthday status for Whatsapp in English, Hindi then share or like us on Facebook or tweet for us. It will motivate us to write more innovative Whatsapp status collection.